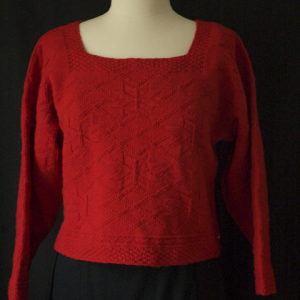 I love to design with motifs from long ago and to knit in a high gauge for lots of detail. 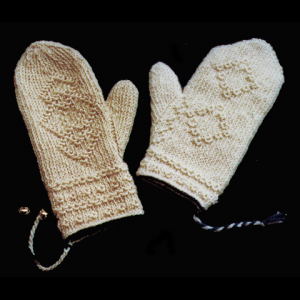 This mitten and hat set was inspired by a sweater from Sunnhordaland, Norway, knitted in the 19th century. 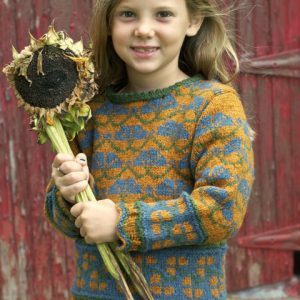 I first saw this sweater in the book Nordic Knitting by Susanne Pagoldh, Interweave Press, 1991. I love the two types of stars, which the Norwegians call “eight-petaled roses”. Although I chose Swedish colors for this pair of mittens, I think the design would look lovely in any number of color combinations. I added a facing for the cuffs and the brim of the hat to increase warmth and longevity. 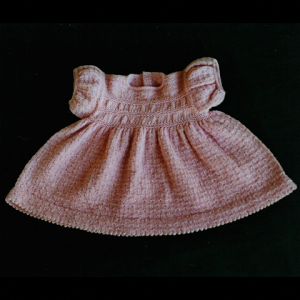 This is created with a provisional cast-on and a picot turning-edge for a crisp beginning to all the pieces. 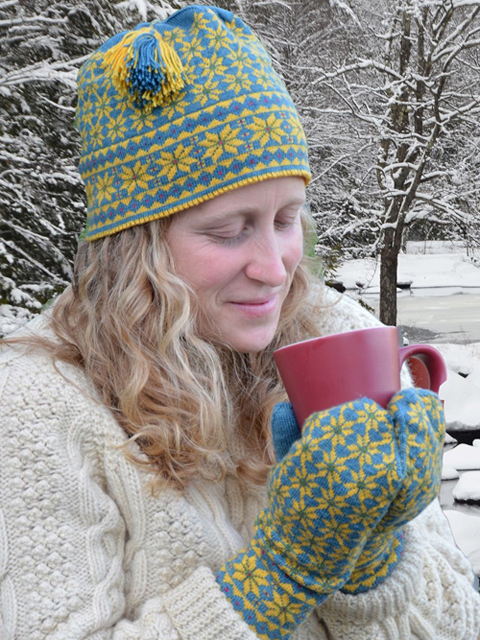 The gauge is high and requires a lot of patience, but you will be rewarded with an heirloom quality hat and mittens set. Gauge in two-color Stockinette stitch: 54 sts and 55 rows or rounds = 4″/10 cm) Adjust needle size to obtain correct gauge. Yarn: Redfish Dyeworks’ 2 ply 50% silk 50% superfine Merino 50g/300 yards (www.redfishdyeworks.com) 1 skein each MC (Blue: #BP613a), CC1 (Yellow: #Y4e), CC2 (Green: #Y-YGBL4a) and CC3 (Maria’s Red).